To improve additive manufacturing productivity and lower cost per part, Renishaw has launched its latest system, the RenAM 500Q. Featuring four 500 W lasers, the compact machine will greatly improve productivity in the most commonly used platform size, to bring the benefits of additive manufacturing to a wider range of industries. 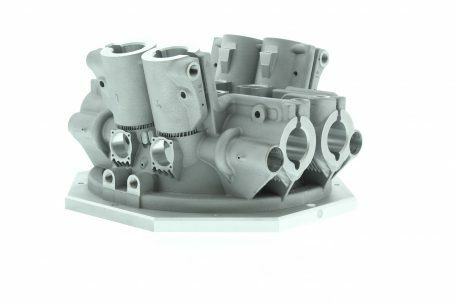 By speeding up the process by up to four times, the RenAM 500Q broadens the market appeal of metal additive manufacturing into applications that were previously uneconomic, driving the technology into new industries. By positioning the machine competitively, Renishaw has ensured the productivity benefits will reduce cost per part, without compromising on the precision or quality of a standard single-laser system. A critical technology at the heart of the RenAM 500Q is the optical system and control software. Laser beams enter the system via four channels, where they are dynamically focussed and directed into a single, thermally controlled galvanometer mounting. The galvo mounting houses four pairs of digitally controlled guided mirrors, which can guide lasers to cover the entire working area of the powder bed. “Renishaw’s additive manufacturing machines and optical systems are designed, engineered and manufactured in-house, giving us exceptional control over system performance,” explained Robin Weston, Marketing Manager at Renishaw’s Additive Manufacturing Products Division. “Using innovative design of the optical system and by incorporating digital controls and dynamic focussing, all four lasers can address the powder bed simultaneously – improving the speed, productivity and capability of the machine. Renishaw is an innovator and leader in creating stable process environments, well placed to manage the additional process emissions caused by multiple lasers. An inert gas recirculation system including a cyclone pre-filter and gas intercooler preserve filter life and provide consistent clean processing conditions throughout the duration of the build. The new system develops the safety and usability features of the single-laser RenAM 500M, incorporating dual SafeChange filters with automated change over to minimise manual intervention. Studies have shown an additional benefit, that powder condition is maintained for maximum reuse, further reducing part costs.